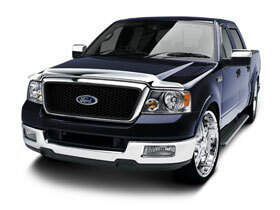 What are the Best Chrome Bug Deflectors & Vent Visors for Cars & Trucks? What are the Best Chrome Bug Deflectors & Vent Visors? Discover the best deflectors for your vehicle. When you choose to install chrome bug deflectors or vent visors on your car or truck, you can bank on custom street style and top-notch protection. Before investing in this upgrade, however, it’s important to make sure you choose the best chrome vent visor or best chrome bug deflector for your specific vehicle. Fortunately, AutoAnything has done the hard work for you so you can make an informed buying decision when it comes to boosting your ride’s exterior protection and cutting-edge good looks. When it comes to chrome window visors and bug deflectors, there are several brands you can choose from. In order to ensure that you’re getting a quality product that’s truly custom-made for your specific vehicle – and one that can withstand the test of time – we recommend choosing a deflector from reputable brands you can trust, like AVS and EGR. 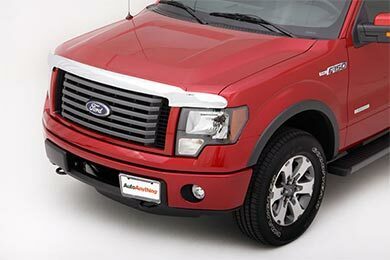 EGR Chrome Hood Shields are some of the best deflectors (pictured) in the industry. Not only do they give your ride eye-catching style, but they also provide rock-solid protection against an onslaught of bugs, road-rubble and whipping wind. EGR deflectors are custom-crafted for your make and model and fashioned from chrome-plated acrylic for sharp looks and rugged durability. For even sharper style and top-notch protection, pair your chrome bug deflector with an eye-catching and functional chrome vent visor set. AVS External Mount Chrome Ventvisors (pictured), in particular, are made from impact-resistant ABS plastic, and they’re actually plated with real chrome. Each one is built-tough to withstand UV rays and flying debris that can otherwise damage your vehicle. Plus, these chrome vent visors are easy to install, with no drilling required. So, whether you have your eye on the Stampede bug shield or a chrome sunroof deflector, you can find all the information on a specific product before making your purchase. AutoAnything even provides vehicle-specific reviews so you can find out which deflector styles work and look best on your make and model. Whether you invest in a quality chrome bug deflector or a durable vent visor, you can bet on a long-lasting accessory at the best possible price when you shop with AutoAnything, thanks to our 1-Year, Lower Price Guarantee and Free Shipping. This page is maintained by Andrew at AutoAnything. If you have any questions, leave a comment below. Please feel free to call toll-free (800) 874-8888 or e-mail [email protected] with any questions. We are delighted to be of assistance in finding the right auto parts for you, whethercar parts, truck parts or SUV parts. Reference # 752-896-123 © 2000-2019 AutoAnything, Inc.